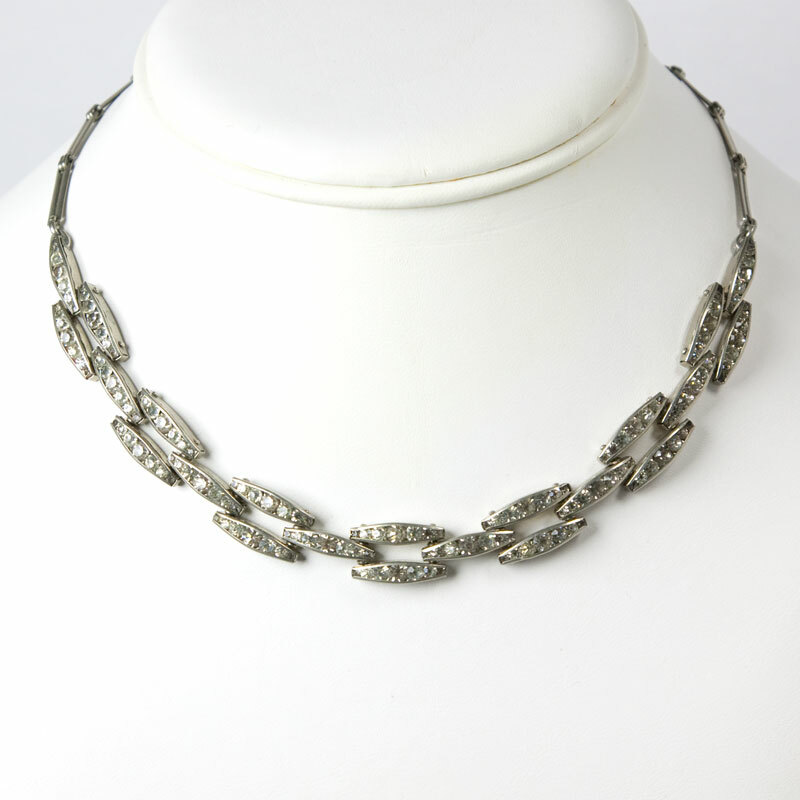 With this vintage link necklace from the 1930s, the maker used curved links of diamanté in a tank-track pattern as the centerpiece. The jeweled links have rhodium-plated backs. 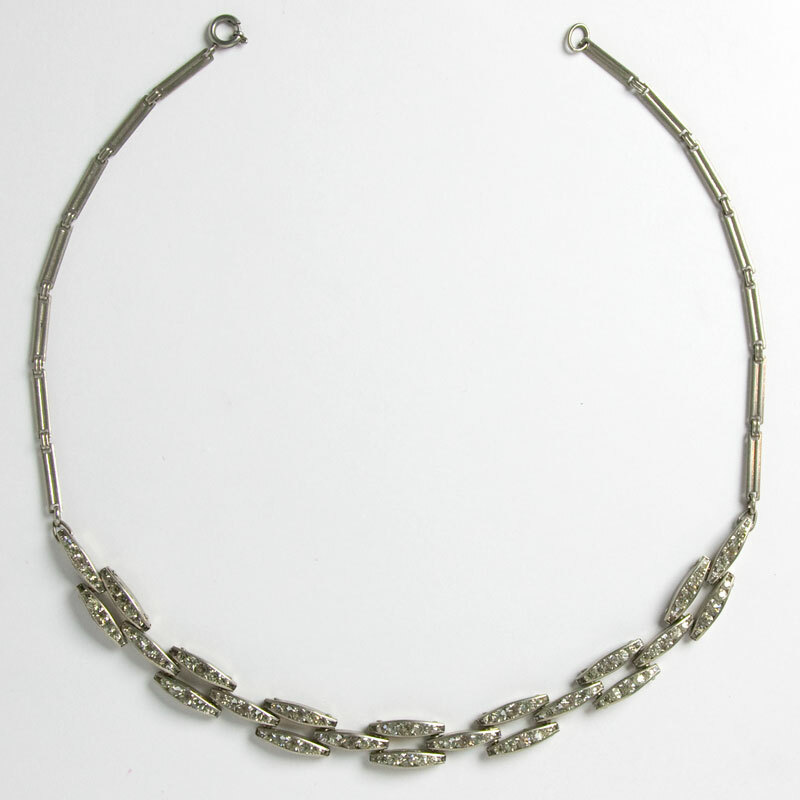 A link-and-bar chain with a spring-ring clasp complete this Machine Age piece. Because this necklace was in my personal collection, I had it shortened. 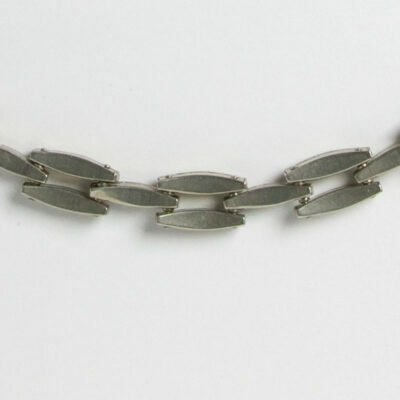 Its purchase includes four additional links, which are each about one-half-inch long. Scroll down to see some tank track bracelets, also by Schreiber & Hiller, to wear with this wonderful necklace. 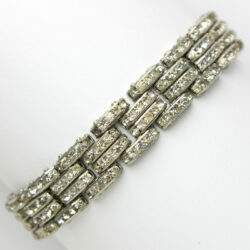 This Machine Age bracelet with its diamanté-embellished tank-track pattern is slightly wider than its counterparts from this maker – this one has a double-row in the center. The flat-topped links each have only five stones. The edges of this bracelet are engraved. 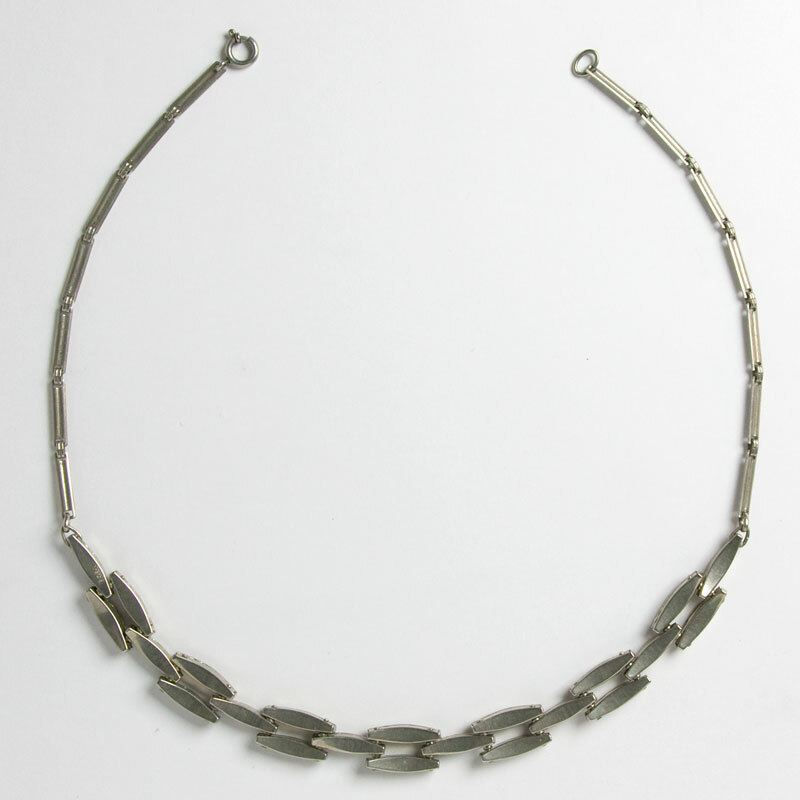 This wonderful German 1930s piece in fantastic condition closes with a concealed clasp and safety catch. Although this bracelet is no longer available, you can scroll down to see similar ones by the same maker. 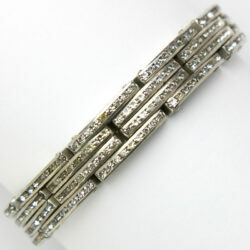 This expansion bracelet is unlike any you've ever seen! Four rows of rhodium-plated curved-top links set with diamanté stretch to allow you to put on the bracelet – it has no clasp. What's amazing is that the mechanism for stretching the piece – a series of springs – is concealed. The last photo shows part of the British utility patent for this construction. 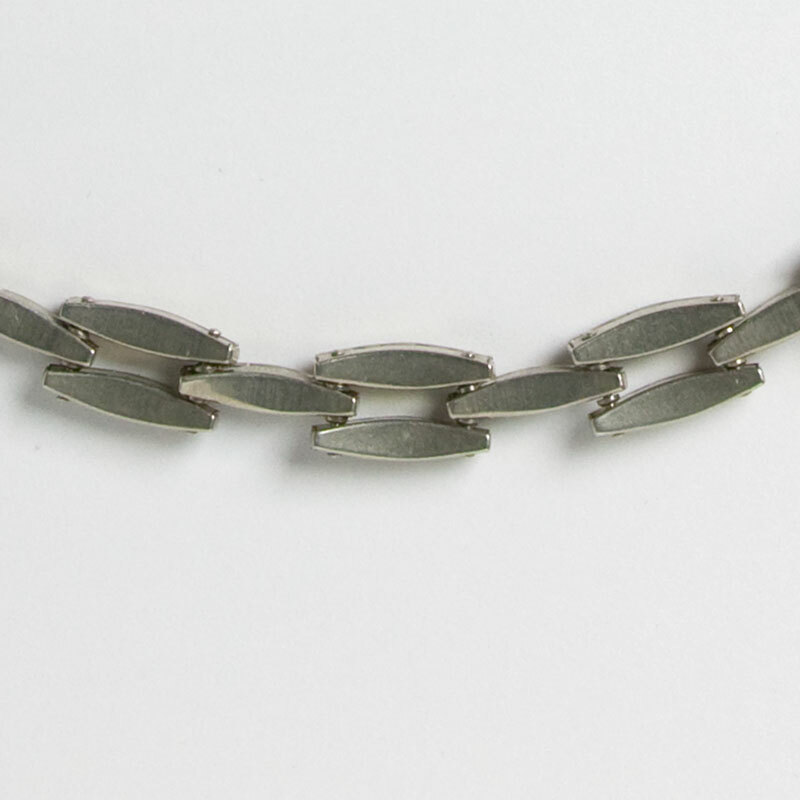 This bracelet is the only piece in this group with the 'SIMEX' trademark. I can’t figure out how to tell you the size of this piece other than how it fits me. My wrist is 6 ¾”, and the bracelet fits me fine. It stretches to the diameter of the widest part of my hand – 8 ½” – that’s required to put it on. Scroll down to see complementary necklaces. 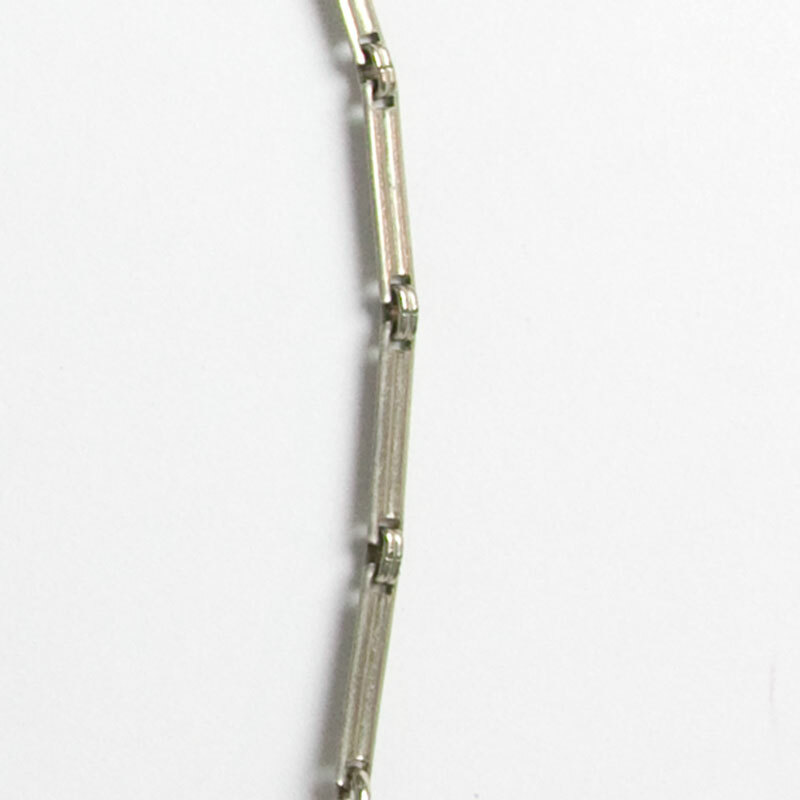 This tank-track bracelet features rhodium-plated links in raised settings that the maker called "roof-shaped". 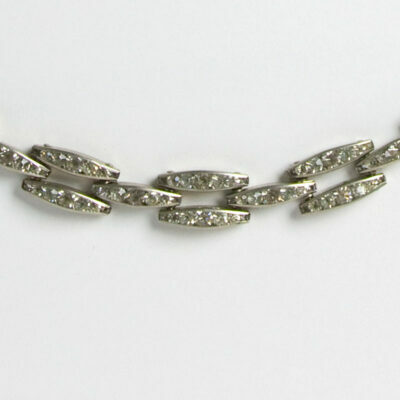 The surface of each diamanté link is pointed. The edges are engraved. Unlike others with this pattern, this one has a double row in the center. 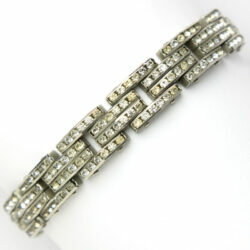 This lovely bracelet closes with a concealed clasp and safety catch. 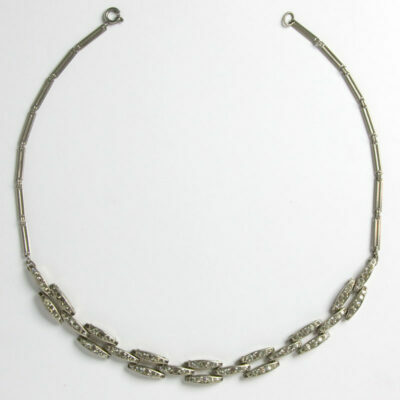 Pair it with other bracelets and/or a similar necklace by this maker for a great day or evening look.